Approximately 85% of the 30,000,000 chickens in this country are born and reared in battery farms. Most end up in human or pet food products when their egg production drops at around 18 months of age. 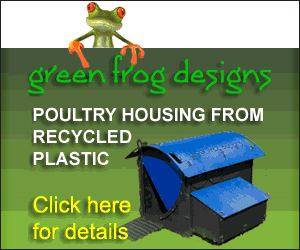 Battery hens are hybrid brown birds bred for their excellent laying abilities. As chicks they are vaccinated against disease and reared in sheds until they are ready to start laying at which point they are moved in long, tiered rows of cages in large artificially lit sheds. Since 1 January 2012 these cages have had to conform to the new style enhanced colony standards (pictured above) and have an area for egg laying, a perch and a dust bath section. 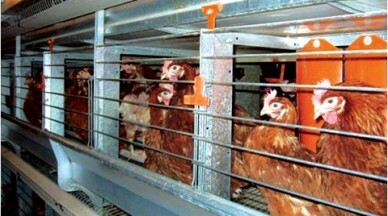 Each cage is designed to hold up to eighty hens, however, the amount of space available to each hen is often only a little more than they would have had in the barren cages they replace. As a response to this a number of national and local rescue groups now exist with the sole aim of re-homing these redundant hens. These rescues have worked with farmers countrywide to reduce the amount of hens sent to slaughter which is no mean feat considering the obligation farmers are under to supply the supermarkets and food producers with specific numbers for meat. 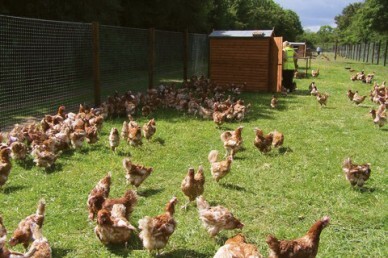 A prospective owner can apply online or by phone to a rescue group who will then arrange for them to collect their hens at a pre-determined place and time on a re-homing day. It is not usually possible to pick and choose hens you must take the ones allocated to you and be warned, they can look pretty ragged straight from the cage which some may find distressing. Most of them are not ill as such, simply out of condition, and brittle bones from lack of exercise can mean they are prone to injury. New owners sign for their hens and in doing so agree that they will be kept as pets only and, because their lifestyle is about to change so dramatically, they also recieve information on the special care they will need initially. Ex-batts will have to be fed layer’s mash or meal initially simply because this is the only thing they will recognise as food at first although they can be gradually weaned onto layer’s pellets and other chicken favourites later on.Food and water should be available to them at all times but they will need to be pointed in the right direction because, again, they will not recognise the feeders provided; they will have only ever used the conveyor belt feeding system in the cages. They will also need to be lifted or manually guided into their new homes at bedtime for two or three nights until they get used to their new housing. It doesn’t take them long to catch on; they are highly intelligent beings. Most ex-batts tend to sleep in a group huddled together on the floor of the coop; they find safety and comfort in numbers and it is their way of keeping warm particularly in the winter months. As a rule the minimum number of hens that can be adopted by new ex-batt owners is three, so that should one die there are still two for company. 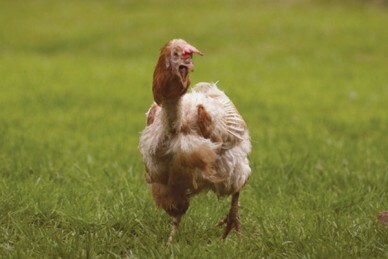 Hens left on their own do grieve and show signs of loneliness and depression after losing companions. Considering the life they have previously led though, battery hens are generally very trusting and friendly with some displaying quite distinct personalities. If you would like more information there are many websites and forums where current ex-batt owners are always more than willing to share advice. 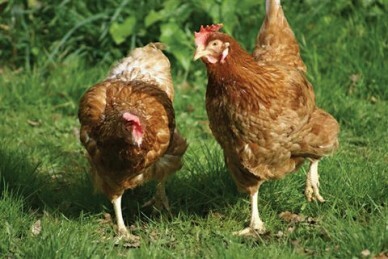 Local rescue groups set up by members of one such forum www.ex-battery-hens.com and calling themselves ‘The Battery Rechargers’ have successfully re-homed nearly 3,000 hens over the last five and a half years and Jo Eglen’s Littlehen Rescue in Norfolk over 20,000 more. Hens from a small rescue group will cost around £3.00 per hen but each will set its own price so best to check this beforehand. If you can offer an ex-batt a new home any of the rescues listed below will be ‘ever ready’ to hear from you. Eirlys Goode’s book Starting From Scratch -The Complete Guide to Keeping Ex-Battery Hens is invaluable for anyone considering adoption and is available for £6.99 + postage by contacting eirlysgoode@myfreeola.com. All profits go to help ex-battery hens.